here's a beauty blog backtrack i wrote years ago (literally 2 years ago) but i still like the tips and the tips written in the comments section were especially helpful. since i am on my way to another Studio 5 segment as well as an upcoming family trip, a trip to LA and a trip to Seatown (my hometown! shout out to the 206!) i decided to provide a little refresher. hopefully this post will give you some direction in what to pack. do you need to bring everything? NO. should you be prepared for anything? YES. tip #1: always carry on your makeup. i know airline policies are strict about carrying on liquids but most foundation bottles are no larger than 1 oz. and beyond that, most items are powder, sticks, or creams. by carrying on your makeup you ensure its safety. have you ever seen the way airlines treat baggage? yikes. 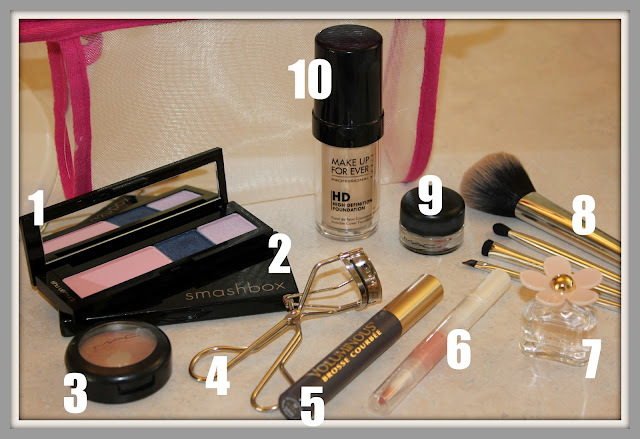 tip #2: pack product that will produce a good daytime look, as well as nighttime look. you don't need to pack every single pencil, paint, powder, pigment, etc. that you own. just plan out two looks, and bring the items needed for both. tip #3: protect your brushes. whether you put them in a brush roll, a protective sleeve, or a baggy, make sure they are flat and have nothing to rub against. brushes are usually a steep investment so don't leave them to roll around your makeup bag where they can be smashed, crushed, or pulled at. the better you treat them, the longer they'll last. tip #4: be prepared! i always pack tweezers, fingernail clippers, chapstick, polish, and a nail file. i hate being away from home, getting a hang nail, and having NOTHING to remove it. uggh. tip #5: make sure everything is closed tight! i've made it to my destination only to find my polish wasn't completely closed and the pressure in the airplane cabin caused the polish to leak onto my makeup. i didn't cry, but my eyes did water a little bit. if you have any other suggestions, please let me know. i would love the tips. Whether I carry on my makeup or not I always keep a compact of powder and or blot sheets in an easy to reach pocket of the diaper bag. Flying always make me shiny (altitude affects my sebaceous glands? maybe that's just me...). i'm a huge mac fan. once, i had an eye shadow that shattered during traveling, and the mac counter gave me a replacement right away, along with a travel tip. open the lid, place a cotton ball inside, then shut. sometimes i have to tear the cotton ball in half. this will provide extra padding to protect your shadow! rachel, i love the cottonball idea. i can't tell you how many products i have shattered. plus, i never thought to return them. next time i will definitely consider that option! I prepare for everything too. My cosmetics bag is always packed for travel. I have about half of what you have here. I didn't think you could carry on nail files/fingernail clippers??? Danielle, nail files are fine as long as they're cardboard. fingernail clippers...well, technically they may be banned from carry-on but i have never been stopped for them. typically i'll try to pack that sort of thing in my check-in luggage.